Reel Therapy is 25' Ranger Center Console powered by twin Honda 150 HPDI's with state of the art electronics –GPS, sonar, VHF radio and cell phone. She's fast and comfortable. There's also an enclosed head (toilet) and plenty of storage. *Rates include up to 4 people. 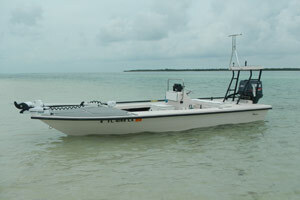 Hewes Flats Boat Reel Therapy II is a 17’ Maverick Flats Boat. Powered with full electronics. 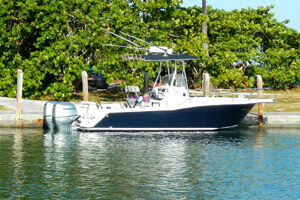 Reel Therapy II is used to fish the shallower waters near shore waters and Florida Bay. *Rates include up to 2 people. A one-hundred dollar ($100) deposit is required to book your charter. If Capt. Jim Peabody cancels the trip because of bad weather, the customer will receive a full refund. If the customer cancels the trip with at least 24 hour notice, they will receive a full refund. A customer who is a 'no show', or does not give at least 24 hours notice, will however, forfeit their deposit. Accepted forms of payment are: Visa, MasterCard, American Express, Personal Checks, PayPal or Cash.